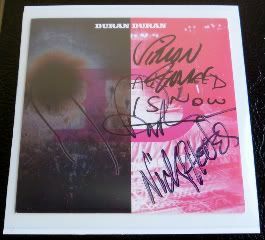 My CD/DVD of All You Need Is Now from @duranduran arrived in our little PO Box. Woot! Mind you, it's not as cool as my autographed RCM from their publicity team, but whatevs, let the collection of autographed magnet liner notes continue! Doesn't mean the Duran Duran marathon is done, by any means. You know, in case you thought so. It's a great morning-after present following last night's supercool Amex Unstaged Concert directed by David Lynch. It was a total visual assault, in some cases for the good, some for the bad - but it was a fabulous concert on the whole. The boys were awesome - of course.